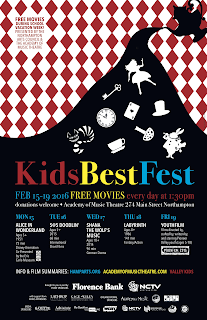 KidsBestFest, Northampton’s FREE annual children’s film festival, takes place during the February public school vacation week. 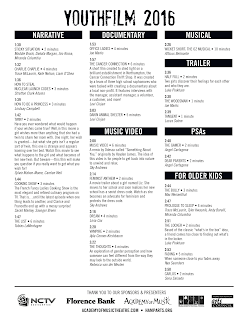 The films featured from Monday thru Thursday include classics and international short films as well as extraordinary films that have not been screened at chain theaters. The week culminates on Friday with YouthFilm, an afternoon of short films written, produced, and starring local youth, ages 5-18. At the beginning of their movie careers, these aspiring filmmakers get to see their work on the big screen at the beloved Academy of Music Theatre. Lewis Carroll's beloved fantasy tale is brought to life in this Disney animated classic. When Alice (Kathryn Beaumont), a restless young British girl, falls down a rabbit hole, she enters a magical world. There she encounters an odd assortment of characters, including the grinning Cheshire Cat (Sterling Holloway) and the goofy Mad Hatter (Ed Wynn). When Alice ends up in the court of the tyrannical Queen of Hearts (Verna Felton), she must stay on the ruler's good side -- or risk losing her head. "I enjoy procrastinating 'cause I'm busy while I'm waitin', doodlin' away." 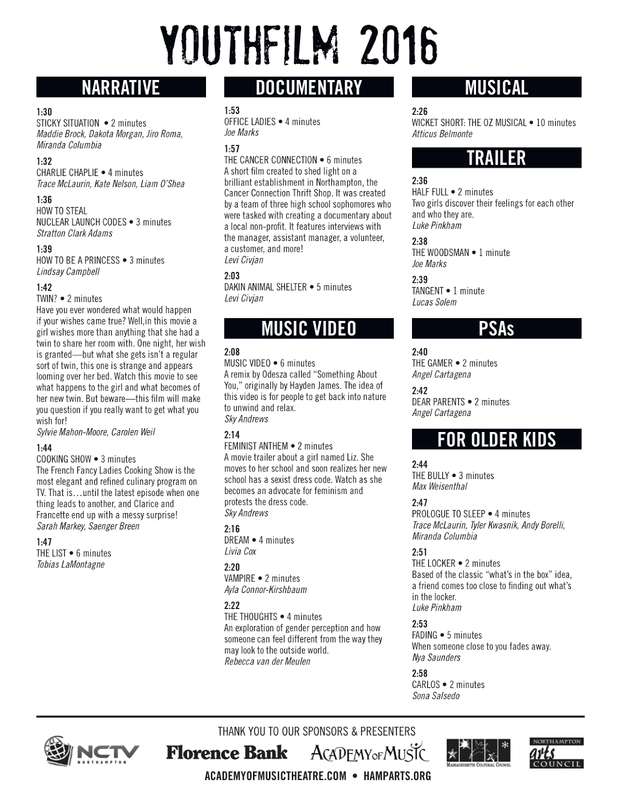 An international reel of 15 shorts designed for a child’s delight, but guaranteed to entertain adults too. In fact, a meeting of the generations takes place in Bunny New Girl (Australia 2015, 6 min), The Broken Wand (US 2015, 3 min), In the Forest (US 2015, 4 min), Niéta (Argentina 2015, 5 min), and Papa (US 2015, 6 min). Artists figure dominantly in many of the films: cartoonists in Cartoon Away (Brazil 2013, 4 min) and The Fly (Italy 2015, 7 min); pastry makers in Decorations (Japan 2014, 7 min). The program is alive with animals doing crazy things: penguins in Can’t Fight This Feeling (Zimbabwe 2015, 5 min), a dolphin in The Winner Takes It All (Zimbabwe 2015, 5 min), and a herd of giraffes in the amazing 5m80 (France 2014, 5 min). Star Wars invades the program, too, with local short Artoo in Love (US 2015, 4 min). Finally, Croatia’s children’s animation workshop is represented with the films The Leaf (Croatia 2015, 1 min) and The Tree (Croatia 2015, 2 min), along with another Croatian child-produced film, Durica (Croatia 2015, 4 min)—a title that means “pouty.” All films are nonverbal or in English, with the exception of Durica. The coming-of-age story about a Canadian First Nations girl who triumphs over obstacles in her young life. Her new teacher discovers her extraordinary gifts as a violinist. When Shana goes on a spiritual journey, she befriends a wild wolf who guides her and she reconnects with her ancestors, including her mother. Finally, she is able to make peace with her mother's death and, absorbed by nature and the spiritual world, Shana finds a unique way of musical expression, which will allow her to have a career as a violinist. Filmed with the People of the Creeks, the Lower Nicola Indian Band near Merritt, BC. The entire cast is local and first time film performers. The Swiss director Nino Jacusso who spent seven months with them calls them 'real actors' as they are the real people. A moving, magical, and yet authentic inter-cultural motion picture. Directed by Jim Henson, produced by George Lucas and starring David Bowie, the story revolves around 15-year-old Sarah’s (Jennifer Connelly) quest to reach the center of an enormous otherworldly maze to rescue her infant brother Toby, who has been kidnapped by Jareth, the Goblin King (Bowie). With the exception of Bowie and Connelly, most of the significant characters in the film are played by puppets produced by Jim Henson’s Creature Shop. 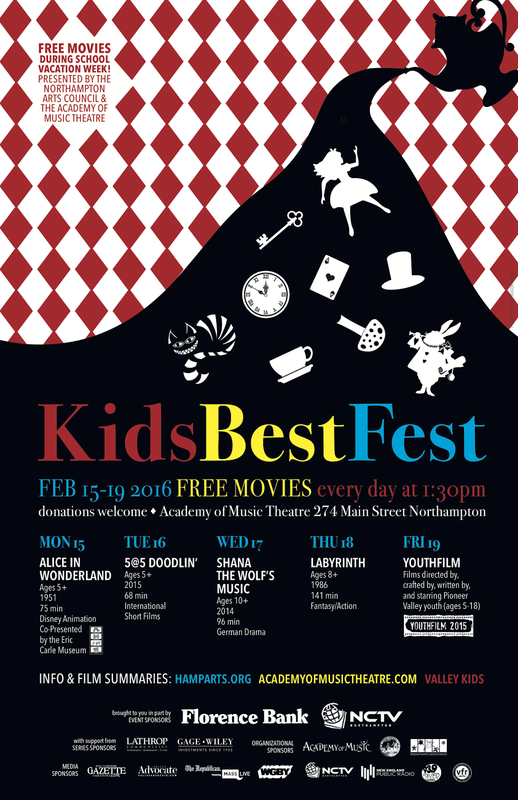 Films directed by, crafted by, written by and starring Pioneer Valley youth (ages 5-18). YouthFilm participants who are at the beginning of their budding careers will be able to see their films on the Academy of Music’s large screen in a theater setting. Join us to celebrate youth work in the video arts.